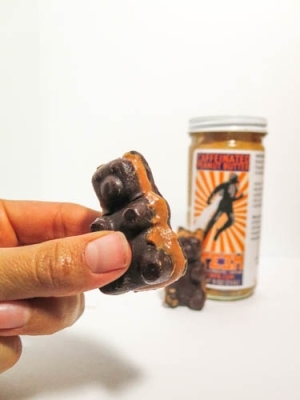 Incredibly addictive peanut butter chocolate bears! Pour the dark chocolate and coconut oil into a microwaveable safe bowl. Microwave in 30 second intervals while stirring until the chocolate has melted. PAM spray your mold, pour â…“ of the mold with dark chocolate. Shake the pan so the chocolate sets in all the grooves. Freeze for 5 minutes. Next, pour in 1 teaspoon of all natural peanut butter on top of first layer of chocolate. Shake the pan so the peanut butter spreads evenly. Freeze for 10 minutes. Pour in the remaining chocolate to cover the peanut butter. Give the mold a shake so the chocolate sets. Freeze for 20 minutes. Enjoy!